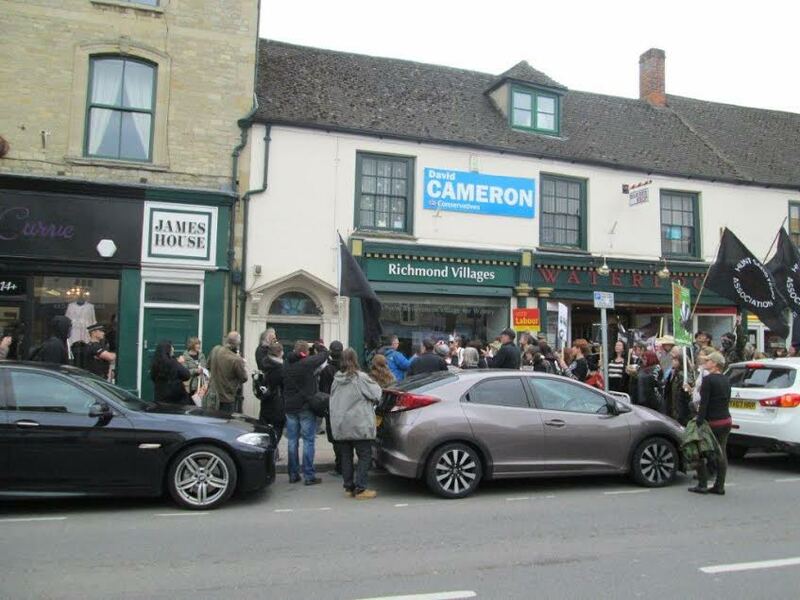 Today’s blog is slightly different to the last two as I would of done a blog today anyway about the march I went on in David Cameron’s constituency, Witney, yesterday. 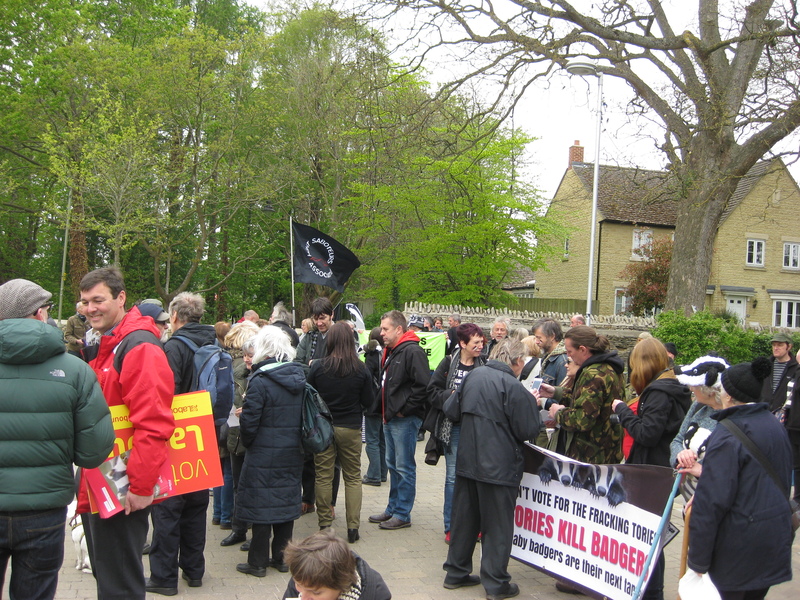 But as I don’t want to go out of sink with my General Election blogs I’ve decided to do this one about badger persecution and the cull, then include the march I went on in Witney yesterday. In the UK badgers are one of the most protected species under The Protection of Badgers Act 1992 however they are the most persecuted. Since the badger cull was rolled out this has brought all sorts of problems for badgers, for example an increased number of cruelty against them. Every month around 2000 badgers are illegally killed. This includes petrol being poured down setts, snares, dog fighting, glass being put down setts and many more disgusting acts. 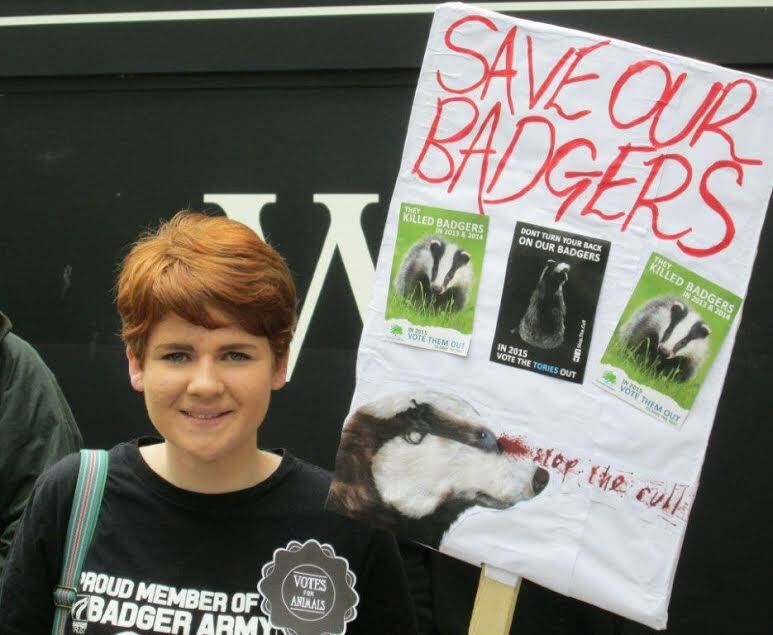 What makes it worse though is the cull which has been rolled out over the past two years, which has led to an increase in badger persecution, doesn’t even work. Even though badgers have always been a victim to wildlife crime, over the past few years, due to the cull, hundreds and thousands of badgers have been slaughtered and targeted by cruelty. As I just mentioned, a lot of people disagree with cull. So much so that over the past 18 months 30 marches have brought thousands of people from all round the country together to protest against it. 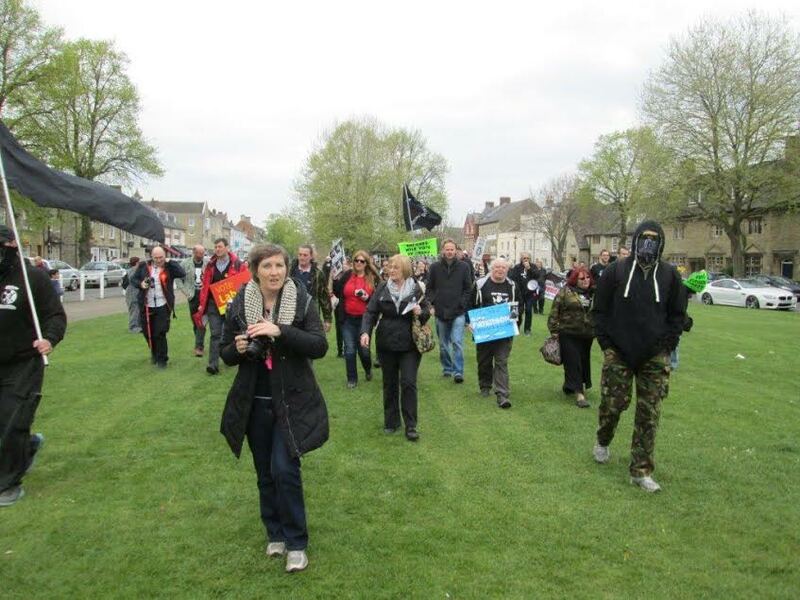 Yesterday I went along to the last march before the General Election on Thursday. 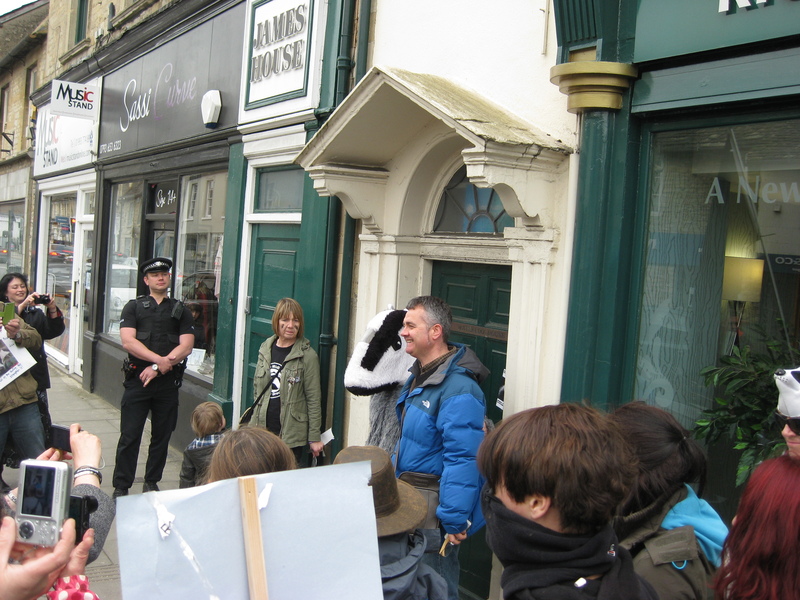 This wasn’t as such a badger march but it was a march to show how much we care about wildlife and how much it matters. 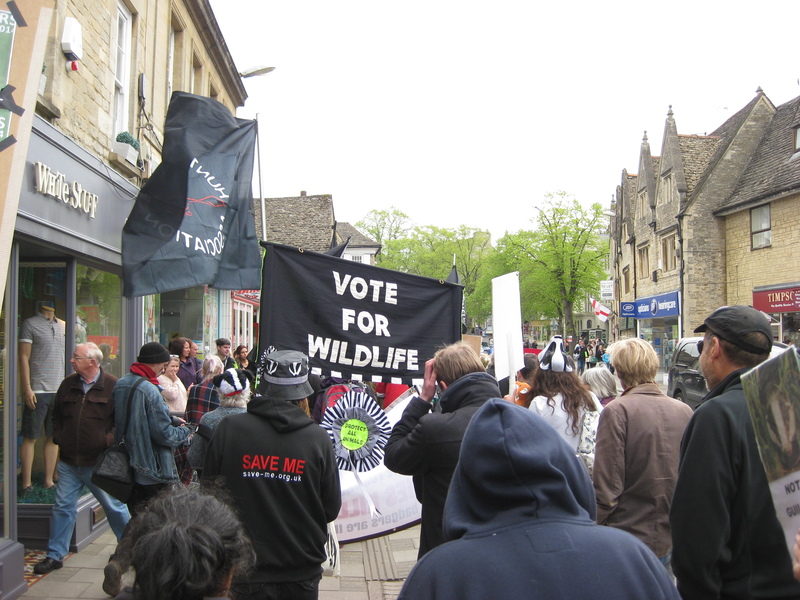 The march took place in Witney, Oxfordshire. This is David Cameron’s constituency and is a Conservative strong hold. Unfortunately even though we’d invited Mr Cameron he didn’t come along but other parties also hoping to represent Witney did. This was the Green Party candidate, Stuart Macdonald, and the Labour candidate, Duncan Enright. For 1pm everyone on the march met in the town centre. Photos were taken of the banners, placards and supporters, and it was good to catch up with some familiar faces and also meet some new people too. Once we were all ready we set off down the high street. Overall there was probably about 100 people. Even though there wasn’t as many as in Worcester the week before we all made some noise and held our banners and placards high. Whilst making our way through the town we definitely got plenty of attention as it was a busy Saturday afternoon so there were lots of people about. Again it was a great feeling to be surrounded by these people and it was a fantastic atmosphere. I went on my first march a few months back and since then I have tried not to miss any as they are so great to go on. Even though they are good to go on I hope yesterday’s was my last, depending on what happens on Thursday. After we’d made our way through the town we ended up on Witney Green where we gathered round and listened to the speakers. First to talk was Lynn Sawyer. She spoke last week in Worcester and as I mentioned then she’s done some fantastic work. 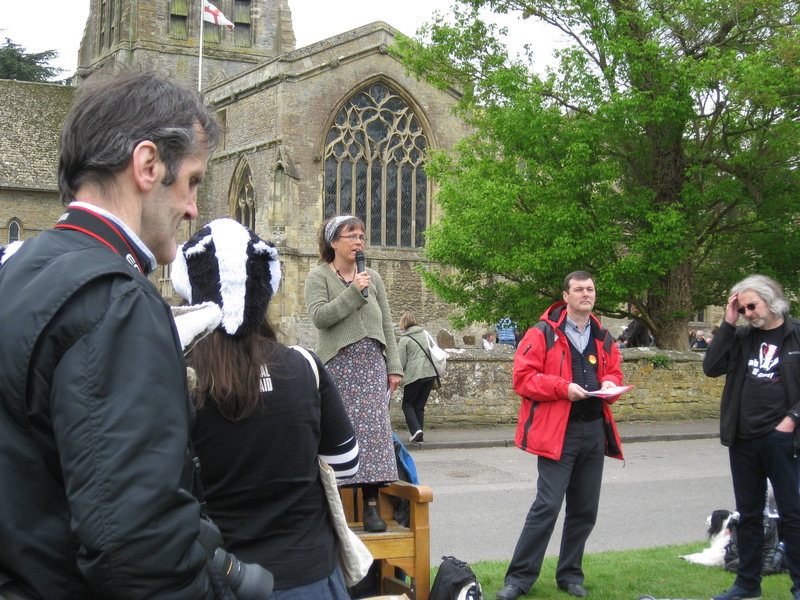 She spoke about the badger cull and how we should be looking out for setts, no matter what happens on Thursday, hunt monitors, the Heythrop Hunt and their disgusting ongoings, setts being badly affected by hunts, strengthening the hunting act and much more. After Lynn’s talk, the Green Party and Labour Party representatives spoke about their polices linking to animal welfare and the cull. It was quite funny as these were all great representatives and it shows that even in a Tory strong hold like Witney, Cameron has parties fighting against him. Next to talk was Dominic Dyer. I’ve heard him speak many times over the past few months, including in Worcester last week. He is a brilliant wildlife campaigner and activist who always speaks very passionately and about a number of key issues facing our wildlife in the UK, and gave some examples from abroad too. 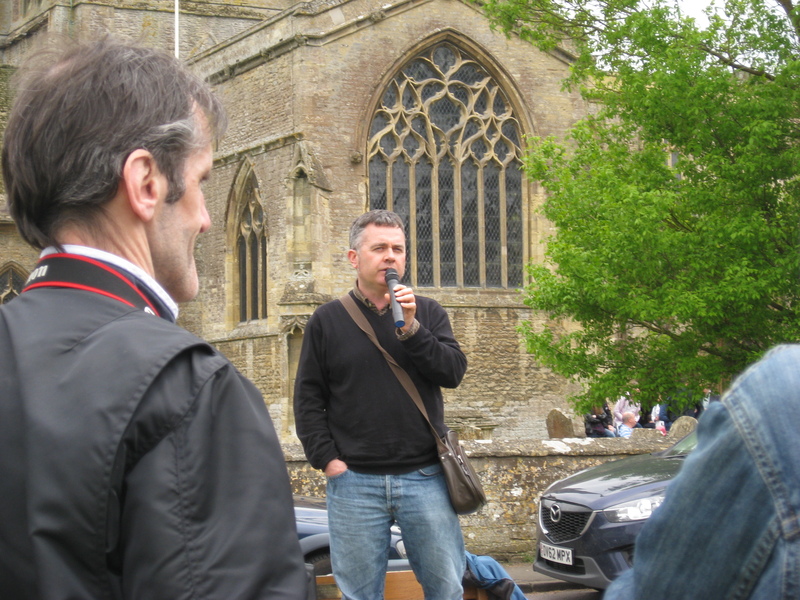 Last to speak was Nigel Tolley who read out a letter which we were about to post through Cameron’s door. The letter had been written by the organiser, Emily Lawrence. In the letter she stated issues like the badger cull and hunting. This letter was to be poster to Cameron because over the past five years he rolled out a two year badger cull, hasn’t done anything for our wildlife and threatens to roll out the badger cull to more areas and repeal the hunting act if he gets into power again next Friday. 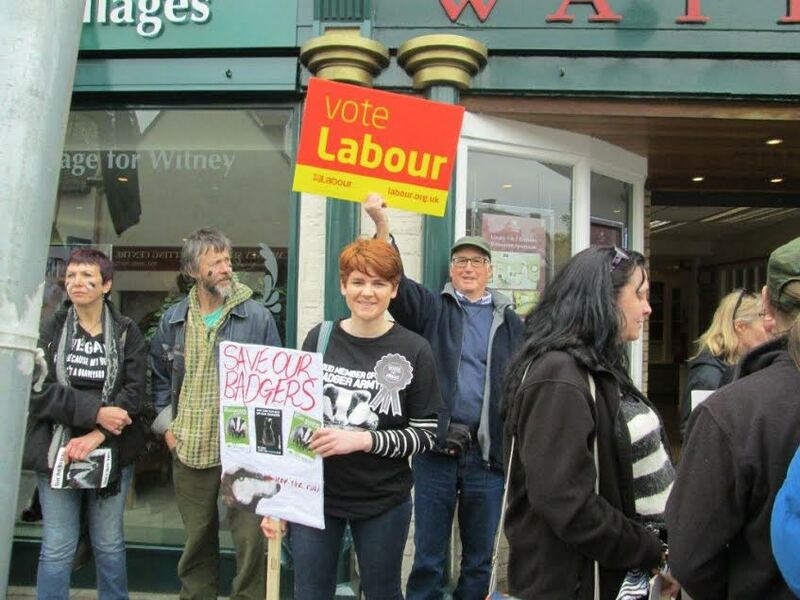 This was a reason why the march took place in Witney. So we all headed back down into the main town centre with the banners and placards held high again, and the shouting echoing down the high street to Mr Cameron’s office. As I mentioned before, unfortunately he wasn’t in but we gathered round outside, the letter was posted and photos were taken too. 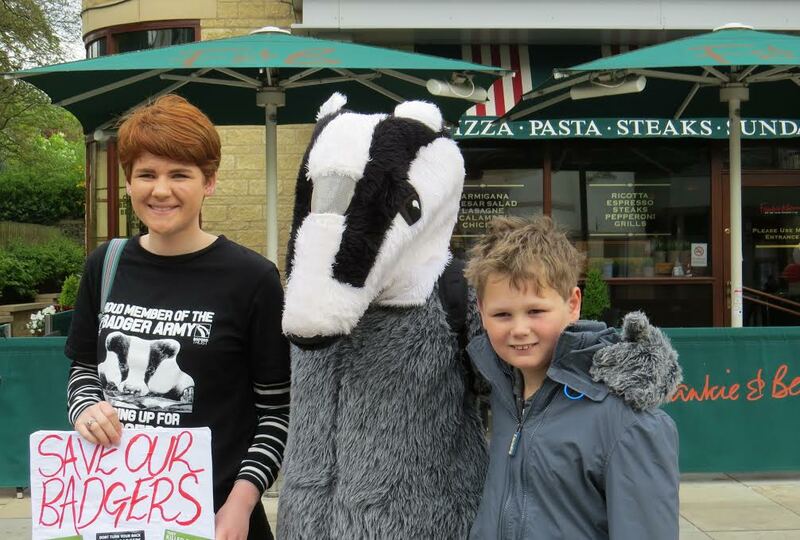 Myself, the organiser Emily (in the badger suit), and fellow young blogger, Alex. Good report Georgia, my daughter lives in Bampton (not far from Witney), her house has a “vote Green Party) in the window. Keep up the good work and the best of luck in your exams. Brilliant to hear and thank you.